Bosdonnat began tracking line contributions in the middle of September 2010 with the original 14 contributions being made by Oracle. Oracle actually contributes code to OpenOffice.org, and then LibreOffice merges those changes, thus resulting in Oracle's contributions to the new fork. 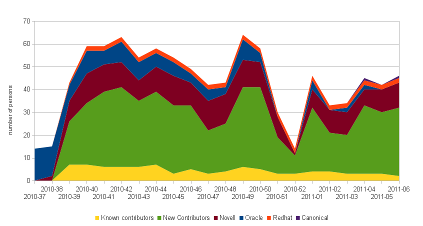 These 112 contributions have continued throughout development, but are dwarfed by the contributions of new developers. New contributors are those that have signed on to help with LibreOffice since the fork, either with code or translations. These contributions make up well over half of the total new changes found in LibreOffice as of mid-February. Weekly contributions in this area have averaged between 20 and 30 with a total number of 517 line contributions. Those who worked on OpenOffice.org previously and are not employeed by any other major contributor are classified as known contributors. While their number of contributions have been fewer, they averaged approximately five per week since the fork. This totals 90 contributions in the 22 weeks of development. Novell has been credited with a large portion of the contributions made to LibreOffice. When looking through changelogs the name Novell is seen over and over again. They were significant contributors to OpenOffice.org and many of their patches are used in LibreOffice to this day. Novell developers averaged in the neighborhood of 10 contributions per week for a total of 205 since the fork. Red Hat, who also contributed to OpenOffice.org, has chipped in as well. With usually two contributions per week, Red Hat developers have provided 39 patches since the fork. The newest known name to join the contributors list is Canonical. They contributed the Human theme and a later fix, but more Ubuntu integration code is likely. Björn Michaelsen contributed 2 patches in the last few weeks so far. Bosdonnat says there are 133 new coders and 55 localizers since the fork. There seemed to be a slight dip at the end of last year according the graph and Bosdonnat attributes that to the festivities of the holiday season.